You can view the spectral decomposition volume on a 2D line in the 2D Line SD View. Load a 2D volume in a 2D survey. Perform the Spectral Decomposition process on a 2D volume as described in Spectral Decomposition. In the Control Panel, go to the View menu and open the 2D Line SD View. At the navigation bar of the view, select the 2D line on which you want to see the spectral decomposition data at Line. Select the time slice and frequency to view the data. 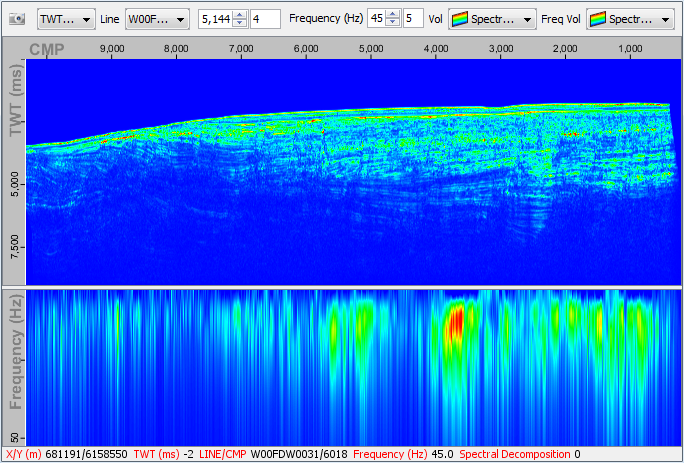 Select the 2D spectral decomposition volume that you want to view along the 2D line at Vol. Select the 2D spectral decomposition volume at Freq Volume to display the frequency volume at the bottom panel of the view.